Thank you so much to everyone who made a guess! I loved your answers and thought they were so fun and creative. Here are some more photos of the girls dressed up that may help you figure out the correct answer. 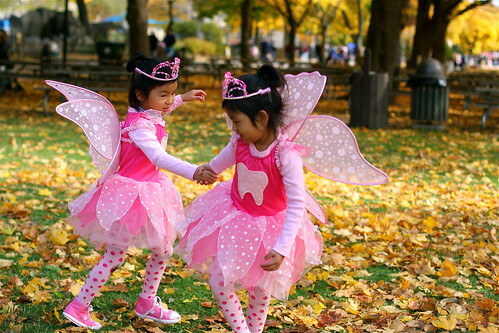 Kenna and Michal are both the Tooth Fairy! Kenna lost her first tooth last week and her second tooth yesterday. Suddenly, it's all things Tooth Fairy at our house. 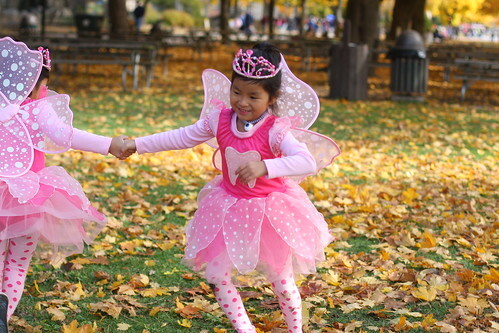 The girls decided they wanted to be the tooth fairy for Halloween somewhat last minute and I thought it was a great -- and very relevant! -- idea! There were seven people who guessed the correct costume and the reason why. I gave you each two entries in the drawing. There was one person who guessed the correct costume but didn't give a reason. I gave you one entry in the drawing. Drum roll please . . . The winner of a one-year subscription to Martha Stewart Living is . . . Dawn at Pearls from the River! So Terri at Marissa at Home you've won a subscription too! Dawn and Terri, e-mail me your address and I'll get your subscription started. I was totally off base but I don't care!!! I love it!!! 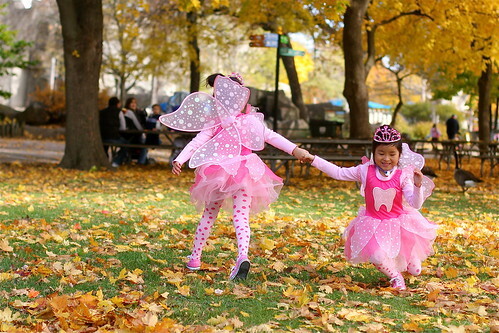 Those are such original and stinking cute costumes!!! Very cute. Very creative! Did you make those? I'm telling you those are some COOL tooth fairies. I'm loving the shoes! That is so cute. I LOVE the tooth fairy idea! Did the costume come that way or did you sew the tooth on? Adorable! COngrats to the winners...GREAT guesses! P.S. Harry lost first tooth on Halloween 2 years ago ---he was almost 7! 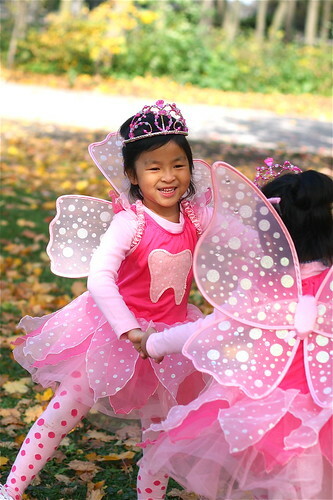 I bought the fairy outfits and wings at Gymboree and then I made a felt tooth, sewed sequins on it, and sewed it to the front of the outfit. I also made a tooth fairy wand for each of the girls. The wands are pretty darn cute! Oh, and the crowns are Sleeping Beauty crowns from the Disney Store. I just removed the Aurora badge from the front and voila! 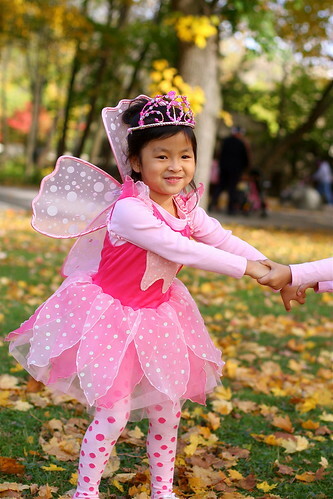 sparkly-pink Tooth Fairy crown! Yippee, I never win anything. Being a dental hygienist, the answer came right to me. Your girls are adorable as ever! Thank you Kristi. Happy Halloween! Congrats, on winning at "I Heart Faces"
Love the costumes, are they hand made? Sorry, I just read your comments, indeed you did sew part of them yourself. You are an amazing mama! An inspiration I say! The girls look adorable!! I stopped by to see your minor adjustment to the costume.......how cute!! I love what you did.....very creative! Sarah ended up wearing her wings, but I couldn't get her to wear the crown, so we settled for a flower in her hair! I can not wait to tell Brynn that the Tooth Fairy has visited your house. She will be so excited because she knows that your girls aren't that much older than her. And this means that she may be next!! I think it is funny how the girls costume and Sarah's (from The Long Road to China) are just about the same (without the tooth). They even have the same shoes and tights on!!! You both must have excellent taste! I just think it is soooo funny and too cute!